One of the least known festivals, with some of the best bluegrass music in the world, happens each year at the Dumplin Valley Bluegrass Festival at Kodak, just up the road from the bustling towns of Pigeon Forge and Gatlinburg. Dumplin Valley Farm is a great venue, with an RV park and campground that is often booked for the festival a year in advance. The event draws great performance talent, and visitors bring their own instruments too, so between the many shows and the jams, the air is filled with music day and night for three days. Walk-ins are welcome, with daily tickets at the gate. The venue features a large barn and tent, so rain or shine the show goes on. There’s a great lawn for kids to play on, no alcohol sold on site, and tremendous home-cooked food. It’s family friendly, has maybe 3,000 visitors and a dozen bands, it’s 25 miles of scenic drive from Gatlinburg – and no one knows about it. Bring your lawn chair and prepare to relax as more than a dozen of America’s best bluegrass bands put on glad performances in the company of other music lovers. If you’re an amateur picker, you may want to bring your instrument too because there’s lots of informal jamming going on. Children are more than welcome. In fact, it wouldn’t be the Dumplin Valley Bluegrass Festival without them. The festival takes place on a farm that oozes down-home Southern charm and hospitality. There’s a big lawn for kids to romp on. There’s no alcohol for sale, but there is lots of delicious home cooking with special local treats and — a family-friendly miracle in itself — clean restrooms. Kids 12 and under get in FREE. Parking is free too. The festival is known for the friendly volunteer staff, the great sound system, the covered performance area that lets the shows go on rain or shine, the beauty of the natural setting, the legendary jam sessions and, of course, the top bands picking their hearts out. Many people come back year after year. It’s an event that every bluegrass fan should experience at least once — and if you come once, you’ll be wanting to come back again. Performances start at noon with shows every hour. There’s a break for a tasty supper around 5 pm. The headline bands play in the evening until 11 at night — and then the jam sessions continue on until people are ready for bed. There’s a popular campground for RVS, campers, trailers, and tents. If you want a camp space, you better book way in advance. The Bluegrass Festival regulars plan their trips to the Smokies every year, heading for this event that feels just like a family reunion … one that was enlarged a bit to include some famous bands. You don’t have to stay in the campground to enjoy the festival. Daily attendees are more than welcome. The farm has plenty of room for everyone, so just show up and get a daily ticket at the gate. It’s an easy and pretty drive on I-40 from our Cabins of the Smoky Mountains in Gatlinburg to the Festival in Kodak, Tennessee, which is north of Sevierville and close to the Smokies baseball stadium. 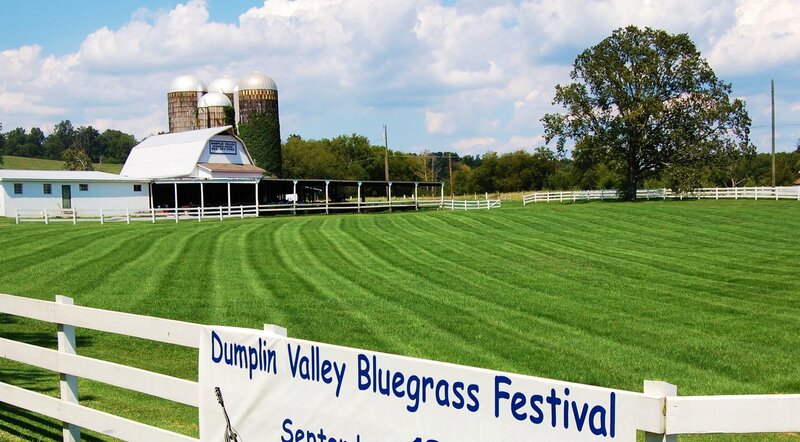 Find all the information you need at the Dumplin Valley Bluegrass Festival website, including the current line-up of bands and the show schedule. Also check out their Facebook page to see lots of great photos and videos that will get your toes tapping. You can email the festival at [email protected] or call them at 865-397-7942 or 865-740-1889.